Kihei Kai offers comfortable and completely furnished one bedroom condos that can accommodate up to four people each. Most have an ocean view from their own private lanai and present a range of Hawaiian motifs. The resort is a nonsmoking facility with designated smoking areas. All condos have fully equipped electric kitchens complete with microwave, full size appliances, air conditioning, ceiling fans, cable TV, high speed cable internet and phone. Kihei Kai is located on the water right on the beach with no road to cross. Maalaea Bay is an excellent swimming beach right in front of our condos. There are 4 miles of undeveloped sandy beach for walking. 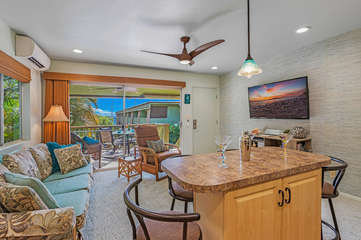 Kihei Kai is a small, friendly vacation resort with 24 Maui condo rentals in a two story building. Our Oceanfront lounge and picnic areas are equipped with propane BBQ grills. KIHEI KAI OFFERS COMPLIMENTARY HIGH SPEED CABLE INTERNET IN ALL IT’S MAUI CONDO RENTAL UNITS. Beachfront, Ocean View, Partial Ocean View and Garden View, 1 Bedroom, 1 Bathroom, Maui Condo Rentals. Sleeper Couches in Living Rooms. Centrally located for snorkeling, hiking, mountains and shopping. Friendly on-site resident managers and staff. Coin operated laundries in common areas. Only 8 miles from the airport. Need to book an activity, rent a vehicle or visit our aquarium? Kihei Kai recommends these local businesses. The ultimate place to book Hawaii activities, Tom Barefoot’s Tours. Some activities sell out way in advance, so plan ahead and explore the website for your upcoming vacation. It contains the largest selection of activities and tours in Hawaii. Over 1500. Thanks to the special website feature, Activity Match, you will be able to easily find the activities or tours that perfectly fit your needs. And at the lowest prices in Hawaii! Enjoy exploring the site. You’ll be amazed by the variety of activity and tour choices in Hawaii, and how much you can learn about fun and exciting things to do on each island. Tom Barefoot’s Tours has the answers you need, when you need them. Maui rental car company, Kihei Rent A Car, is a family-run business offering affordably priced rental cars and conveniently located on the south shore of Maui in the oceanfront town of Kihei. Rated five stars on TripAdvisor and Yelp, The Snorkel Store will have everything from beach chairs and snorkel sets to helicopter tours and anything in between. Use coupon code kiheikai10 at checkout. Explore Hawaiian marine life & so much more at The Aquarium of Hawaii! Visit Maui Ocean Center and book your tickets today, SAVE $5 on adult journey pass with promo code KK0817!